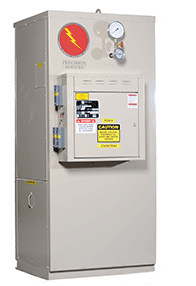 Precision water heaters are built for heavy commercial, institutional and industrial applications. Our designs rely on conventional, time-tested technology that is highly reliable, simple to maintain, and delivers exceptionally long service life. 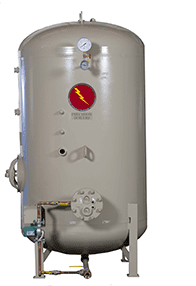 Available in a variety of standard tank sizes, recoveries, and vessel configurations, Precision has a storage water heater that will fit most any specification and will deliver the performance and reliability that system design engineers and facility owners demand. They are available in electric (HWS series), fossil-fuel fired (FPW series), or indirect heated designs, lined with either Precision Seal (PS) or Aluminum Silicate Cement (C), both NSF-61 compliant. Our PS lining is a two-part-epoxy alternative to glass, which is suitable for storing water up to 180oF, prevents buildup and corrosion and, unlike glass linings, can be repaired in the field. 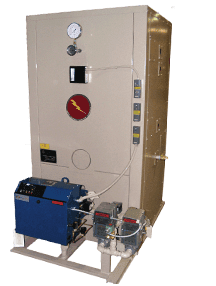 Our water heaters are commonly used to heat potable water for: K-12 school buildings, college and university buildings, dorms, hospitals, office buildings, government buildings, etc. The PHWS uses existing thermal energy sources to heat domestic hot water. The vessel is fitted with a shell-and-tube heat exchanger that accepts either process steam or high temperature hot water to heat the potable water stored inside the NSF-61 compliant vessel. For ease of installation, the heater is shipped fully assembled and ready to use with all the accessories factory-sized, pre-piped and pre-wired. The PHWS saves time, money and manpower that would otherwise be used to a install separate fuel-burning device inside the facility. Storage capacities range from 125 gallons to 4,000 gallons of actual capacity.